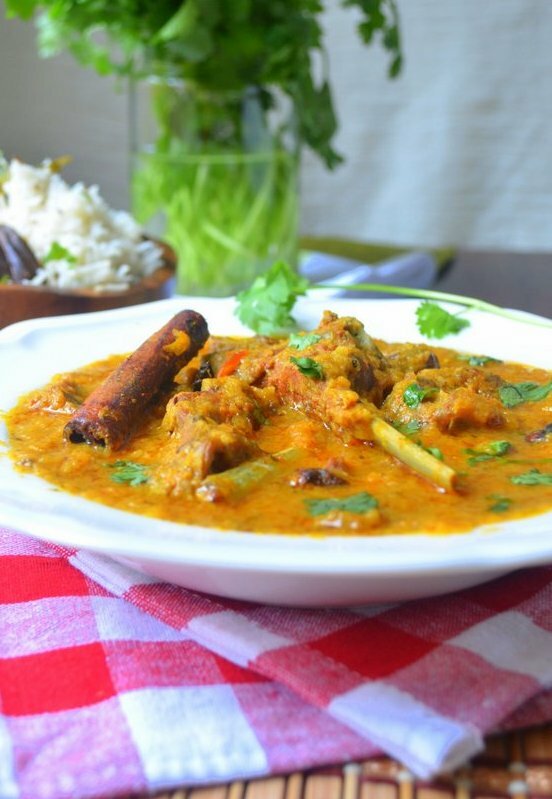 Lamb Curry with Jeera (Cumin) Rice | The Flavor Nook! On Sunday afternoons, myself and my brother used to eagerly wait at the table for the spicy, tasty, lip smacking (read ‘burning’) chicken or mutton curry paired with pulav/pulao. And as soon as Mom served it, we would eat until our stomachs are thoroughly filled. In the yesteryears, at home we would have non-veg – chicken/mutton/fish only on a weekend which made Sunday meals kinda special. For the rest of the week our diet was only vegetarian which was quite a nice balance of food. Now, here at home we cook meat only once a month or couple of months since whenever we eat-out it’s mostly chicken (for me) and seafood (for husband). In India, most of the time ‘Mutton’ refers to ‘Goat’. Here in the US, it is difficult to find Goat meat except for some ‘Halal’ stores. So, whenever we make mutton here it is ‘Lamb’. Both ‘Goat’ and ‘Lamb’ can be cooked in a similar way. Ardent mutton eaters may be able to distinguish the taste of lamb from goat meat. Else, you will not see much of a difference in my opinion. Both are tough red meats but the good thing about goat is that it has less fat in comparison to lamb. I actually had a post on Lamb Curry wayyy back. But, I tweaked the ingredients and the procedure a little and thought this came out better tasting and was a little quick on time. So, I decided to come up with a new post! 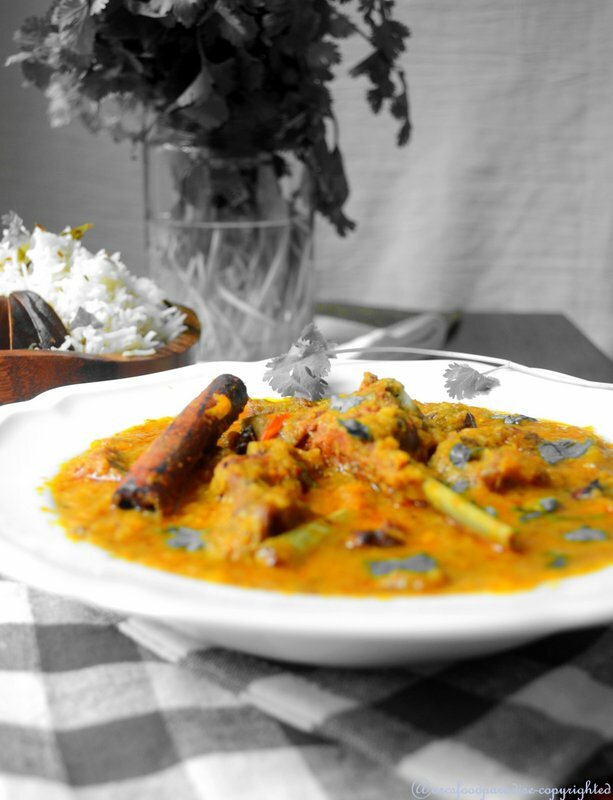 The spices play the most important role in any meat curry/side-dish. To me, non-vegetarian dishes need to be spicy to bring out the real taste. At the same time, the amount of spices should be well balanced with the right amount of salt. 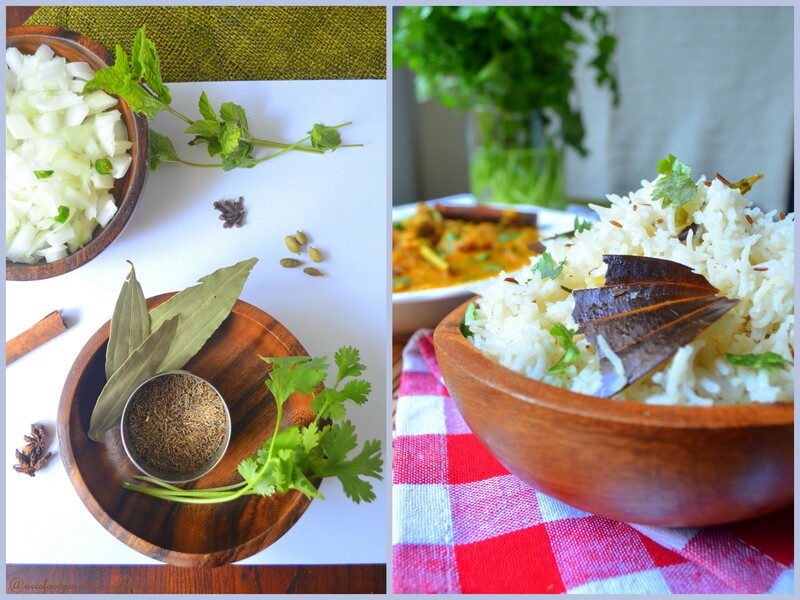 I served this super savory dish with ‘Jeera Rice‘ or ‘Cumin Rice‘ because it’s simple, yet flavorful which makes it a perfect combo. This rice is equally great with any spicy vegetarian side-dishes or with raita. 1. Wash the lamb pieces well under running water in a colander. Set aside for at-least 15 minutes until all the water is drained. Then, take the lamb into a mixing bowl. Add the spices – turmeric powder, red chilli powder, garam masala, ginger-garlic paste and salt. Mix well making sure all the pieces are well coated with the spices. Cover with a lid and refrigerate for at-least an hour or over-night (preferred). 2. When properly marinated, take the lamb in a pressure cooker. Add about 1/2 cup of water. Cover and let cook for 5 whistles which may take 15 to 20 mins. Remove from stove and let cool for at-least 5 to 10 mins until all the pressure/steam is out. 3. In a skillet, heat about 3 tsps of oil. Add cumin seeds, cinnamon stick, anise star and cloves. Let them splutter for a minute or two. Add chopped onions and green chillies and saute until the onions are translucent. Add turmeric, red chilli powder, mint leaves and diced tomatoes. Saute for a few minutes until the tomatoes are soft and tender. Take this mixture in a blender (remove the cinnamon stick and anise) and blend into a smooth paste adding about half cup of water. 4. Once the pressure cooker has cooled down, open the lid and add the gravy to the lamb. Mix well. Cover (lightly, without the whistle) and cook for another 10 to 15 mins. Using a fork, check if the lamb is properly done/cooked. Add salt, garam masala and lime juice and give a quick mix. Taste it and adjust salt & chilli powder if needed. Turn off the stove and remove into a serving bowl. Garnish with coriander leaves. 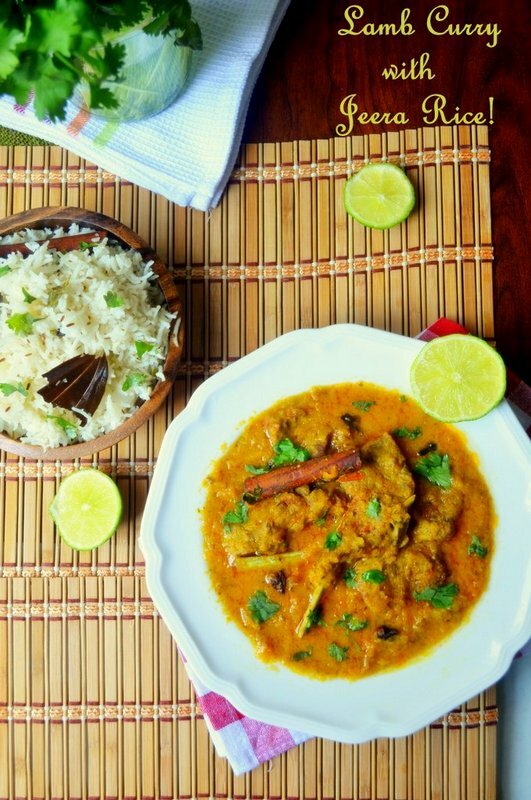 Serve with plain white rice or pulav or simple jeera/cumin rice! 1. In a rice cooker, take Basmati rice. Rinse under running water once or twice. Add water double the amount of rice i.e., 4n1/2 cups. Set aside until the tempering is ready. 2. In a pan, heat about 3 tsps of oil. Add cumin seeds, bay leaves, cloves, cinnamon stick, anise star and cardamom pods. Saute for a couple of mins. Now, add onions and green chillies and saute until the onions are palely brown. Add mint leaves and salt. Mix well. 3. Add the cumin tempering mixture to the rice cooker. Mix well and cook the rice. Just before it is done, add coriander leaves to give a nice aroma to the rice. Serve with your favorite side-dish or raita! Pingback: Egg Masala « Food Paradise!